I think spiral knitting is hard to understand when you read about it, but becomes easier as you do. Once you grok the process (either in a disk or in a tube) you can easily do it either way. But don’t be surprised if it takes you a while to understand. The Beginning of the round is on the right (note a Big Blue stitch marker at the hem/cast on edge, and the tails of yarn. In the center of the work, you can see (not too clearly, but...)an orange stitch marker, and even less clearly, a turquoise one. the orange marker divides G1 and G2. Here the stitches on the needle are labeled—G1 and G2. If I were working on a set of 5 DPN’s, (instead of 2 circ’s) G1 and G2 might be Needle 1 and Needle 2. 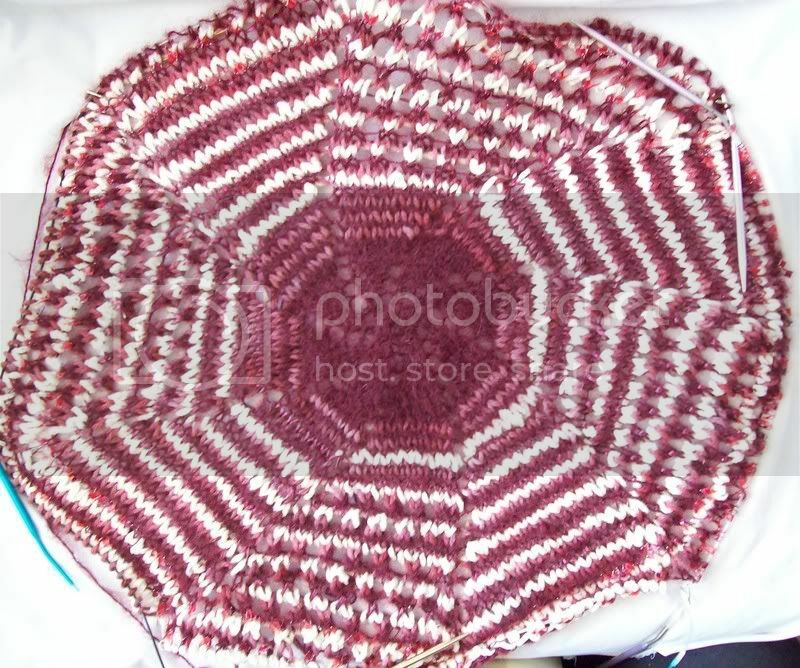 I am using 2 colors (paired) so I am getting 2 row stripes. If I worked with 4 balls of yarn /4 colors, I would get a pattern of 4 single (1R) stripes would be repeated every 4 R's. There are lots of options--thick and thin stripes, multi color ones.. the numbers of balls of yarn you use, and how you position them will control the pattern. As I knit, and come to the end of group 1—it’s easy to find-(with out a stitch marker!) –the last stitch in the group tends to stretch as you work it --Because it has been knit with a different strand of yarn. Here, at the end of group 1, you can clearly see, 2 strands of yarn, one strand in the last stitch knit (on the needle) and one strand (the same color) coming from the stitch in the row below. At the beginning of this needle there are again 2 strands of yarn available for use--The raspberry (in the last stitch knit) and the grape, in the last stitch of the previous row. G3 is worked with the grape yarn. At the end of G3, 2 strands of yarn again, and again, the lower yarn, from the stitch in the previous row is used. The work is turned, and the new round is started with this yarn. Worked in a tube, (this neck ring or socks like these, or a hat, or...) the spiral is subtle. But you can do the same thing working in the round in a flat disk, the changing yarns make a clear spiral –this WIP—is a fun shawl that is being knit from an assortment of yarns, silky ribbon yarns, smooth yarns, fuzzy mohair ones, chenilles-—8 different yarns in all! The spiral is clearler in a flat disk like this. Flat disks like this can be Knit in Public projects. If you use 8 yarns, and 8 circ’s; 8 knitters can work on one shawl at once! The knitters sit in a close circle, and work from one end of a circ to another, and as soon as they finish a row, the yarn moves to the left, and they start the next row with the yarn coming from the right. -and 4 segments can be work in a 2 row pattern of R1: K1, YO , * k2tog, YO. /R2: Knit all stitches. The completed shawl can be raffled off as a fund raiser, or donate. This project is fun for a guild or knitting group, too! Spiral knitting is fun way to make some wild and crazy socks.. Use up all the odds and ends—worked entirely in solids, the result is subtle stripes--see the socks above. Worked in solids and self striping or hand painted (alternately) it’s a bit more mottled. Work with no solids, the socks defy description—sometime they are wonderful, sometimes, well wild and crazy, and sometimes. A mess! 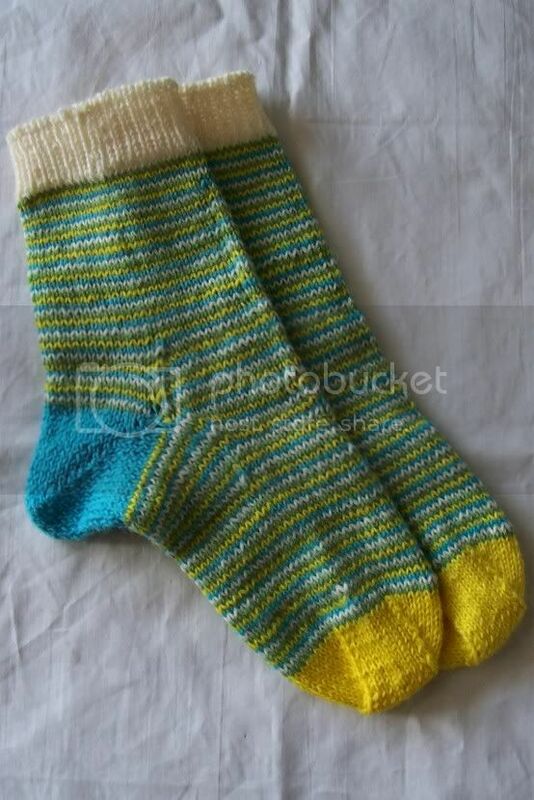 But there is the fun of it--and worked from scraps and odd and end, they become a pair of free socks!—perhaps best worn under boots for shoveling snow; or as a booby prize for a contest. Thank you so much for your awesome explanations. I really enjoy knitting in spirals (of one sort or another), but the one thing that continues to stymie me is how to start a disc without holes towards the center. This is fabulous--so much great information. Thanks! Meant to ask--I'm seeing lots of bobbles in knitwear for next fall. Do you have a tutorial? Am I driving you crazy yet? You're right about spiral knitting - so much easier to do than to explain! I've made baby hats with 3 colors, spiral knit, and at the top of the crown I knit a length of icord of each color, with a knot tied in each end. Makes a cute little topknot, and was an easy way to end off the hat.